Office bearers of the ITAT Bar Association, Mumbai, had an interactive meeting with the Honourable President and the Honourable Vice – Presidents, Mr. Pramod Kumar and Mr. G. S. Pannu on 26-11-2018 at the Chamber of the Honourable President. Various issues relating to administration and the functioning of the ITAT were discussed. Honourable President patiently noted the suggestions made. 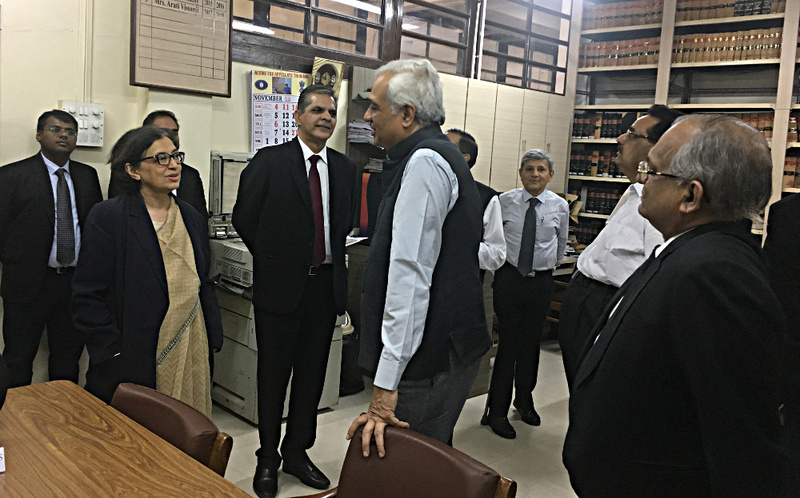 The Office bearers had requested the Honourable President to visit the Library of the ITAT Bar Association.This suggestion received prompt attention and on 27-11-2018, the Honourable President along with the honourable Vice Presidents, Mr. G. D. Agarwal, Mr. Pramod Kumar and Mr. G. S. Pannu, visited the library and interacted with all the members present. The Hon’ble President and Vice-Presidents took a round of the entire Library which is a treasure house of numerous magazines, reports including AIR, SCC, GSTR, commentaries on directs taxes and international taxation,other resource material and subscribes to various online tax platforms useful for the members. They also saw the Digest of Cases from 2003—2017 published by the Association. The Honourable President was informed of the website www.itatoline.org which professionals and others across the country have come to rely upon. Readers may send their suggestions to itatonline.manager@gmail.com. I am an avid reader of the orders/ decisions of different tribunals and courts in direct tax matters published by your organisation in itatonline.org. The digest of case laws prepared by you are also of great help. The digest from April 2018 is overdue. If you kindly take the pains to prepare and publish the same on itatonline.org a reader like me would be immensely benefited.